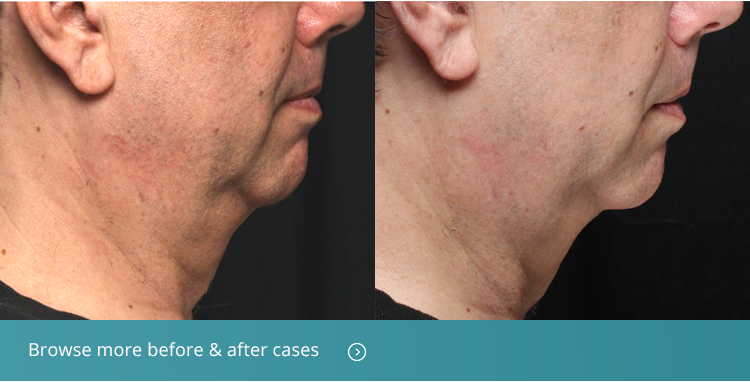 Pelleve uses radiofrequency energy to precisely heat the deeper layers of your skin without damaging its surface. When these deep layers are heated, it causes collagen, a key component of the skin’s healthy support structure, to contract. This contraction both increases skin tightness and causes skin cells to produce more collagen. This new collagen helps replace what age has degraded, improving overall tightness and smoothing wrinkles. Pelleve can be used to treat skin lines from the nose to mouth corners (nasolabial folds), wrinkles around the mouth, loose skin above and below the eyes, crow’s feet, forehead lines, jowls, and neck laxity. Although many patients begin to see results immediately after one treatment, most patients begin with a package of 3-4 treatments spaced about 1 month apart. During the procedure, your skin will feel warm, like a hot stone massage, but you shouldn’t experience pain. No downtime is associated with Pelleve.